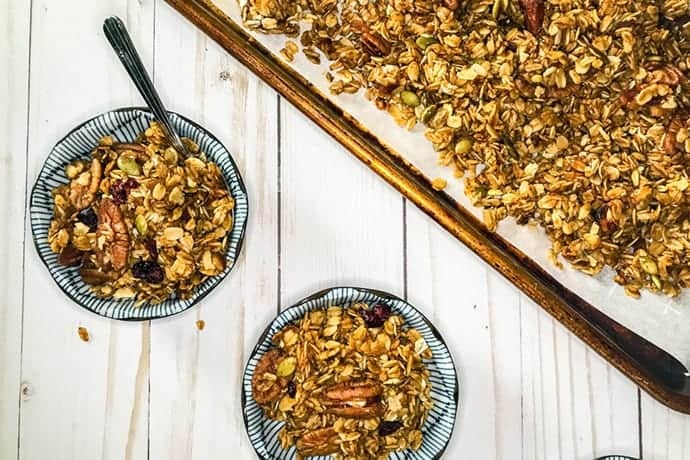 Slow Cooker Pumpkin Spice Granola with Maple, Dates, and Pecans is a fall treat that not only satisfies those autumn flavor cravings but the redolent fall scents as well. It’s a feast of healthy goodness, and a cozy, hearty breakfast or snack on a blustery day. Your kitchen and in my case, house, will smell like fall has ever so gently but decisively permeated your space. For hours. Believe me, the fragrance alone is worth making this recipe. The result is an amazingly delicious granola with the pumpkin spice flavors we love. And this big batch pumpkin spice granola will yield 12 servings and will keep at room temperature for around 3 weeks. More if you freeze it. 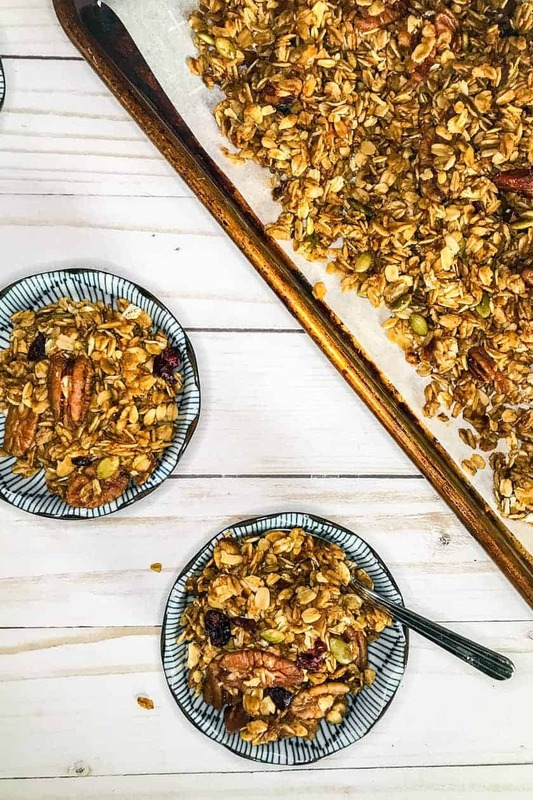 Fair warning, though, making this pumpkin spice granola is a little bit addictive. No worries, though. You can always justify it by making batches for friends and family this autumn. 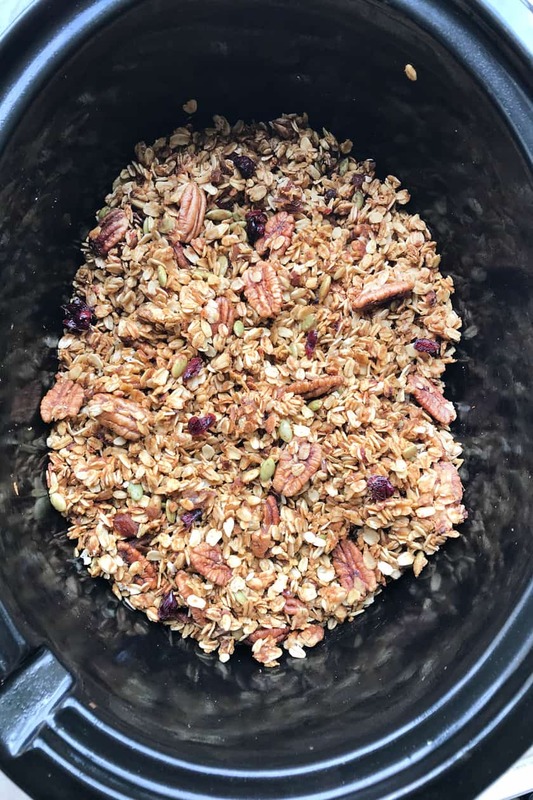 Making big batches of granola are incredibly simple in the slow cooker. But the key to crunchy granola is air flow. It’s really the only trick you need. In order for those sweetly coated oats and nuts to crisp up from soft and chewy to crunchy is how you place the lid. When the slow cooker is fully covered with the lid, it creates a warm and steamy environment. Perfect for cooking, not ideal to toasty granola. The solution? Simply keep the lid slightly askew so that it’s only partially covered. 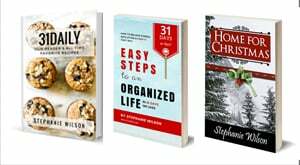 The will allow steam to escape and pull extra moisture out of the slow cooker. 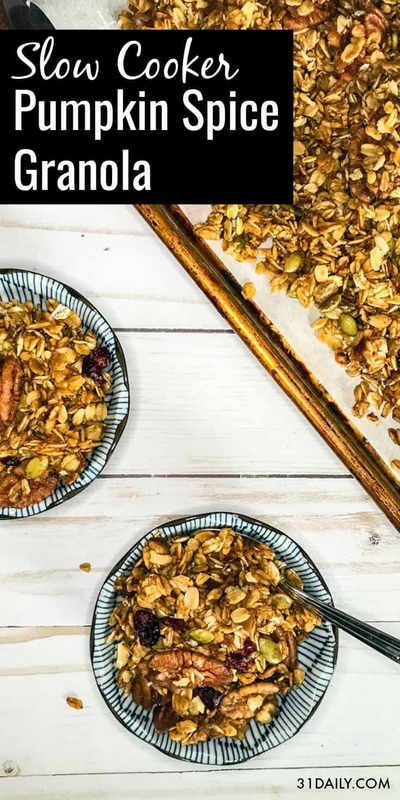 Want to Make Pumpkin Spice Granola in the Oven? 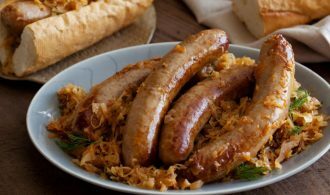 If you don’t have the 2-3 hours to spare for the slow cooker. The recipe converts easily to oven baked instead. Simply follow the instructions as written for the recipe. Instead of putting it into the slow cooker, divide the granola onto two parchment-lined baking sheets. Preheat the oven to 350 degrees and bake for 25 to 30 minutes or until golden brown. Remove from the oven and let cool completely. Toss with 1/2 cup dried fruit of choice; raisins, cranberries, etc. Spray the bottom and sides of a 5-quart slow cooker with cooking spray. Spread the oats, pecans and pepitas in the slow cooker; stir to combine. 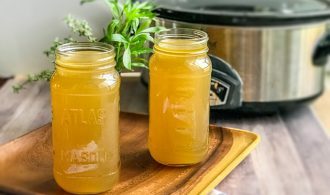 In a large glass measuring cup, add the finely chopped dates, maple syrup, pumpkin puree, coconut or olive oil, vanilla, brown sugar, spices, and salt. Microwave on High about 1:30 seconds to 2 minutes, just enough to warm and combine the liquids. Whisk together and pour over the dry ingredients in the slow cooker. Stir to combine until all of the ingredients are evenly moistened. Cover the slow cooker, leaving the lid slightly askew so the steam can escape. This will yield a crispier granola. Cook on HIGH for 2 to 2-1/2 hours, or until the pecans are toasted. Stir halfway through and remember to leave the lid askew. Spread the granola on a baking to cool completely. It will continue to crisp as it cools. Store pumpkin granola at room temperature in an airtight container for up to 3 weeks or freeze for several months.